The smallest sale of the day was $3000 for lot 374, Miss Anatina. 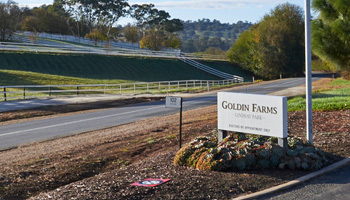 Nathan Tinkler’s reported $40 million debt to Gerry Harvey might well be extinguished before the country’s largest horse sale finishes on Wednesday. The Patinack Farm dispersal sale at the Magic Millions sale yard on the Gold Coast has smashed through the $21 million mark on its first day. It is the first of four auctions organised by Mr Harvey to recover monies owed to him by Mr Tinkler, former coal billionaire and racing identity. “I’m very happy and Mr Tinkler thinks he’s been robbed,” Mr Harvey joked on Sunday. Mr Harvey, who shared a table with Mr Tinkler and former Magic Millions co-owner John Singleton, was by far the biggest spender on the first day. Representatives for well-known trainers Chris Waller, Gai Waterhouse, Anthony Cummings and David Hayes also attended the Gold Coast sale. Breeding operation Godolphin, owned by Sheikh Mohammed Bin Rasheid Al Maktoum, and Segenhoe thorougbreds, owned by BRW rich lister Kevin Maloney were also represented. 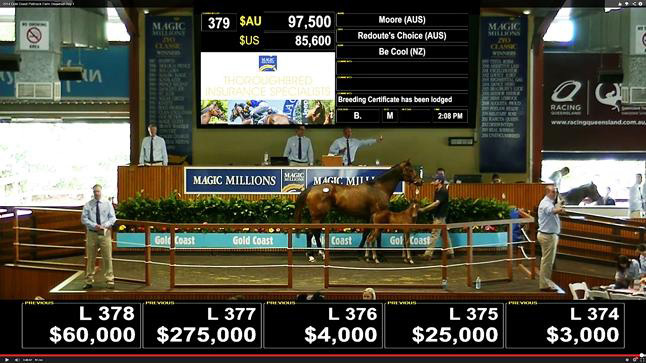 The largest sale for Patinack was $850, 000 for lot 455, Bel Mer. Bel Mer is in foal to the once Tinkler-owned champion All Too Hard and was purchased by South Australian breeding operation Goldin Farms, owned by Hong Kong multi-millionaire Pan Sutong. Bel Mer’s father is Bel Esprit, the same as champion sprinter Black Caviar. The smallest sale of the day was $3000 for lot 374, Miss Anatina, also in foal, but to the Patinack-owned stallion Trusting, who will go on sale on Wednesday. Yearlings will sold on Monday, two-year-olds on Tuesday and racehorses and stallions on Wednesday. After the horse sale, Patinack’s Canungra premises will be auctioned on October 23 followed by two Hunter Valley properties and a ­Victorian property. 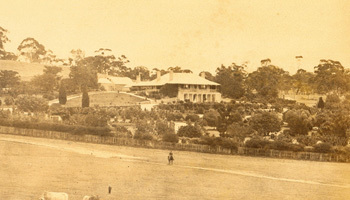 Mr Harvey took a charge over Mr Tinkler’s Patinack Farm as a condition for a loan. While the exact amount owed is unknown it is believed to be in the vicinity of $40 million and all horse flesh and property associated with Patinack Farm was put up for sale when Mr Tinkler admitted he couldn’t repay the debt and other offers fell through. Earlier in the year it was reported Patinack Farm had been sold as a going concern to overseas’ interests for $130 million. However, that sale fell through. The proceeds of that sale would have allowed Mr Tinkler to repay Mr Harvey and contribute to the proposed, but now defunct deal, with Peabody Coal and the mothballed Wilkie Creek mine in Queensland. The proposed deal was largely touted as Tinkler’s “resurrection moment” and was supposed to be the first step in turning the former mining electrician’s fortunes around.